It wasn’t the coined name ‘Paris Bistro’ that inspired me so much as the assorted shapes and bright colors of the bean variations seeming to implore me to snag a bag for some future preparation. Shades of small oval pink beans, deeper reds of kidneys, black beans, northern beans, smaller touches of yellow and green lentils surrounding large creamy white limas and speckled varieties resembling tiny birds eggs snugly nested in the spring, all combined into one clear plastic packed Zursun blend. Though we dare speak of spring as yet, since winter has barely begun, the word snug reminds me of the Canadian geese this very morning quietly huddled closely together at the lot pond, barely moving, until early frost subsided and the sun fully merged, then off they went, devoid of the simultaneous loud squawking one often hears at warmer times of the year. So what do you think, aren’t these beans pretty? I picked them up at Home Goods, but otherwise you can get them through Williams Sonoma, or straight from the source at Zursun in Idaho. After a soaking in cold water overnight, I was delighted that the medley maintained the diverse cheerful hues even after cooking which I did simply adding just one onion cut in half, and a couple of bay leaves to the water mix for its boil. Having some juicy slices of roast lamb remaining from a special dinner one evening seemed a nice combination to prepare set atop some mixed greens while adding a touch of ooh la la in a sort of festive arrangement to these now quieter bleak days of January. It is called the Paris Blend after all. Really for the topping you could use any type of sliced meat, roast beef, London broil, pork tenderloin, even a nice piece of grilled sockeye salmon. 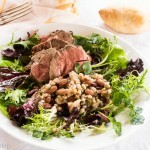 But for today, we’ll simply call it, Roast Lamb, Paris Bistro Bean Salad. Bon Appetit. You can find the Spiced Peach Blog recipe for dressing the mixed greens here. 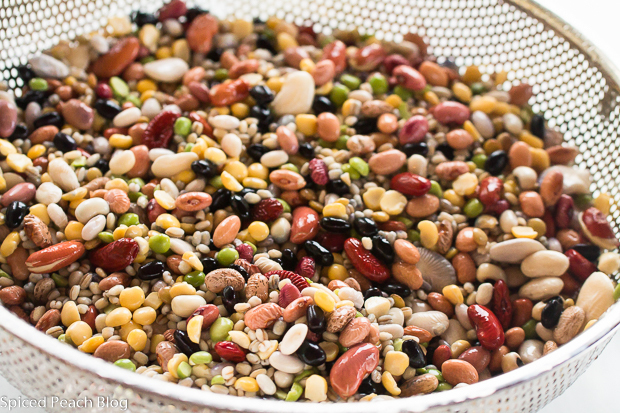 Place beans into a colander and sift through for any loose debris or pebbles, rinse. Place beans into a large pot, covering with cold water about 6 inches, let soak overnight. Drain beans into a colander, rinse out pot, rinse beans, and tumble back into the pot covering with cold water about twelve inches, add in the onion and bay leaves. Heat beans to boiling, reduce heat and simmer for about 45-60 minutes until beans are tender, drain, fish out onion and bay leaves, transfer beans to a long platter.Prepare the dressing. Whisk olive oil a bit at a time into the Dijon mustard until well emulsified. Whisk in the lemon juice and vinegar, season with salt and pepper, check seasonings, whisking in a bit more olive oil if desired. Stir shallots and celery into the beans, fold through the mustard dressing then sprinkle in the salt and pepper, check seasoning adding more salt if needed then stir in the parsley. 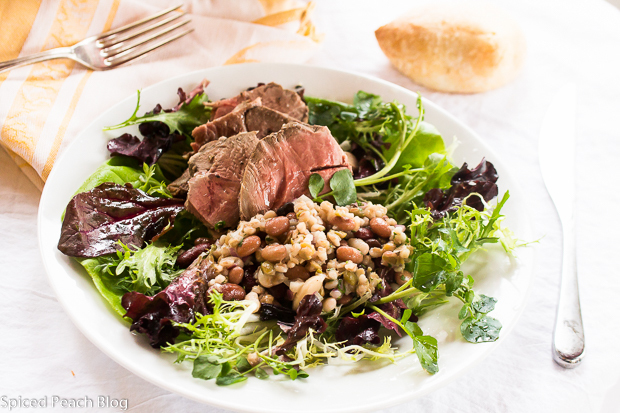 Dress mixed greens, assemble onto plates, top with sliced roast lamb and top with a few spoonfuls each of the Paris Bistro Bean Salad. This entry was posted in Meats, Salads and tagged Lamb and Paris Bistro Bean Salad, Zursun Paris Bistro Blend Beans. Bookmark the permalink. Post a comment or leave a trackback: Trackback URL. You had me at beans. This looks wonderful! What a great idea for a weekend supper. Pinning. Refreshing and healthy. Thanks for sharing, Peggy. Hello Jolma, Happy New Year to you! 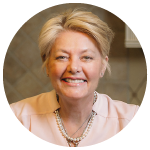 I hope all is well at Beyond Her Kitchen. I look forward too your next beautifully crafted post. Thanks so much on the Roast Lamb, Paris Bistro Bean Salad, a delicious blend and quite colorful in the varying bean sizes and shapes. That looks like a colourful, delicious meal. Perfect for mid-winter. Hi Teresa, Thanks much, it was a colorful delicious meal. I love the variety in the bean mix, perfect for mid-winter. Oh I love these beans! I just love the bean mixes..rhey always look so colorful and pretty..the photo of this dish is simply stunning! And yes..roast lamb sounds very apt here. Hi Pragati, Thanks so much! The mixed Paris Bistro blend is sensational, all sorts of flavors and textures while providing lots of color and dimension. You could certainly prepare this without the lamb. Hope all is well at Kamal Kitchen! Your plate is just gorgeous. I have never heard of the brand, Zurson, although I have shopped at Home Goods in Henderson. I like the color combination of the beans also. Lamb, a delicious choice. When I make lamb, which is not often anymore, there are no leftovers. Nice post. Thank you so much Mary. I do believe you would very much like this bean combination. I have tried a number of the Zursun beans now and have found each to be delicious and interesting in some way. I keep my eye out for the bags but I would definitely mail order from them too. Agreed, lamb is so good!